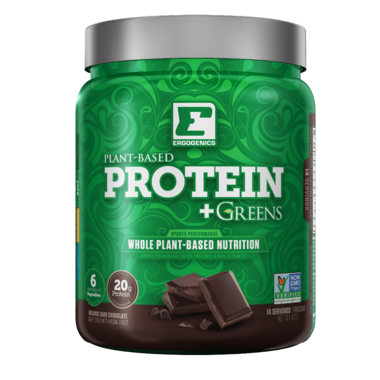 Ergogenics Plant Protein + Greens is water-Soluble and is an excellent source of Essential Amino Acids. It has a complete spectrum of natural organic proteins, with all 20 amino acids used in the human body, including all 10 essential amino acids. The proteins found in hemp are similar to proteins found in the human body. 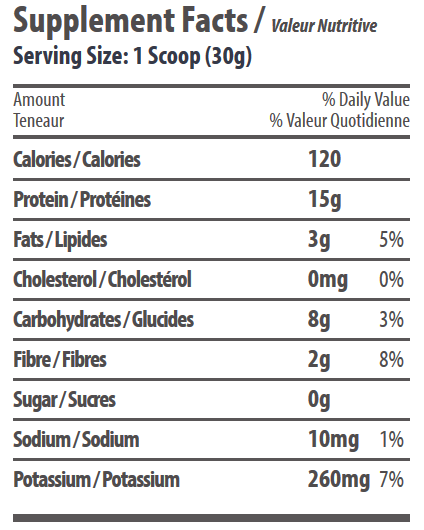 Soluble Hemp protein also provides essential fatty acids (EFAs) omega-6 and omega-3 in a healthy 3:1 ratio. Hemp is also an excellent source of dietary fibre and is very rich in vitamins and minerals. Organic Ingredients: Soluble Hemp Protein Concentrate (Cannabis Sativa), Spirulina (Spirulina Platensis), Chlorella (Chlorella Vulgaris), Kale (Brassica Oleracea Var.Viridis), Barley Grass Juice (Hordeum Vulgare), Wheat Grass (Triticum Aestivum), Alfalfa (Medicago Sativa), Broccoli Floret (Brassica Oleracea Var. Italica), Cabbage (Brassica Oleracea Var. Capitata), Spinach (Spinacia Oleracea), Wakame (Alaria Esculanta), Matcha Green Tea, Organic Dark Chocolate (Cocoa), Monk Fruit (Siraitia Grosvenorii). Best vegan protein on the market. Zero sugar & tastes great. The added greens are a bonus.